Authors: Alex Rudee, Nate Wilairat, Nitya Chhiber, and Paul Steinberg. Photo Credit: Webshots American Greetings member photos. Fueled by strong international markets for ivory in East Asia and the United States, elephant poaching became a serious problem in Kenya during the latter half of the twentieth century. The volume of ivory exported from the African continent grew from 204 tons in 1950 to 1,000 tons in 1980. Tourism is the highest revenue-earning industry in Kenya and 70 percent of tourists come specifically to see wildlife. Thus poaching threatened the country economically and ecologically. In the 1980s alone, Kenya’s elephant population shrunk from 65,000 to 16,000. In 1989, Richard Leakey, the outspoken head of the Kenya Wildlife Service, lobbied the parties to the Convention on International Trade in Endangered Species (CITES) to outlaw the ivory trade. To draw media publicity to his cause, Leakey famously intercepted the sale of 2,000 tusks and set them afire in front of global media crews. Coverage of the event reached 850 million people worldwide, and brought the ivory issue to the forefront of public attention. Despite protests from representatives of southern African nations with stable and well-managed elephant populations, parties to CITES moved the African elephant from Appendix II to Appendix I in October 1989. Under Appendix I, all trade in elephant products was abolished and the legal trade in ivory ended abruptly. Over the next decade, Kenya’s elephant population stabilized and elephant surveys recorded 24,669 elephants in 2006. E. B. Barbier et al., Elephants, Economics, and Ivory, Earthscan Publications, London, 1990; J. J. Blanc et al., Elephant Status Report 2007: An Update from the African Elephant Database, Gland, Switzerland: IUCN, 2007; and M. Y. Said et al., African Elephant Database 1995, IUCN, Gland, Switzerland, 1995; S. Hitch (1998) Losing the Elephant Wars: CITES and the Ivory Ban, Georgia Journal of International and Comparative Law 27(1): 167–98; and R.E. Leakey and V. Morell, Wildlife Wars: My Fight to Save Africa’s Natural Treasures, St. Martin’s Press, New York, 2001; D. B. Weaver (1999) Magnitude of Ecotourism in Costa Rica and Kenya, Annals of Tourism Research 26(4): 792-816; and Nancy Lee Peluso (1993) Coercing Conservation? The Politics of State Resource Control, Global Environmental Change 3(2): 199–217. The tribal lands of the Maasai are now divided into individual ranches as required by national law. Male heads of family hold these land rights, as women could not own property in Maasai society prior to the 2010 Kenyan constitutional reform. However, norms of land use among the Maasai dictate communal use of the land, and while the Maasai believed the partitioning could help secure their land for the long-term, they also feared – correctly – that it would have detrimental effects on their people. The Maasai use land primarily to raise livestock. 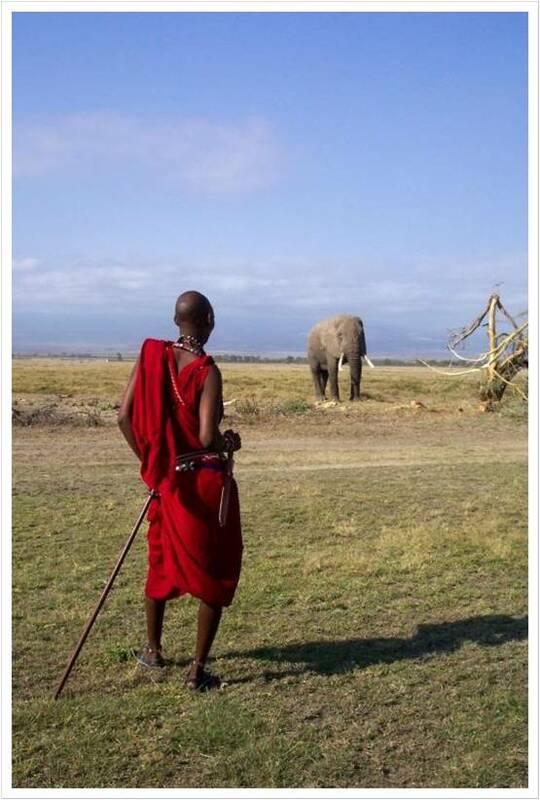 Traditionally, the Maasai have owned and used land communally and nomadically. Different lands – such as dry-season pastures and small family pastures (olokeri) – have different rules controlling their use. Community members can only use dry-season pastures when all other forage has been exhausted. Olokeri serve as reserves for calves and infirm animals. A council of senior elders enforces the usage rules. Both the British colonial government and the Kenyan government viewed this arrangement as inefficient, and divided land into private farms and ranches. Initially, the government introduced group ranching to replace traditional arrangements but the Maasai continued their communal management practices. In 1994, the Kenyan government decided to subdivide group ranches into individual parcels, with ownership held by male heads of family. These property rights permit owners to sell, lease, or use the land as they wish. The Maasai expressed concern that the small parcels would be insufficient to sustain a livelihood. Moreover, there is evidence indicating that some Maasai grazing land has been permanently lost to external private ventures because of the reforms. Ranching practices have intensified on private plots, harming wildlife. E. Coast (2002) Maasai Socioeconomic Conditions: A Cross-Border Comparison, Human Ecology 30(1): 79-105; E. Fratkin and R. Mears (2003) Sustainability and Pastoral Livelihoods: Lessons from East African Maasai and Mongolia, Human Organization 62(2): 112-22; S. K. Seno and W. W. Shaw (2002) Land Tenure Policies, Maasai Traditions, and Wildlife Conservation in Kenya, Society and Natural Resources 15: 79-88; and D. Western, R. Groom, and J. Worden (2009) The Impact of Subdivision and Sedentarization of Pastoral Lands on Wildlife in an African Savanna Ecosystem, Biological Conservation 142: 2538-46. Kenya contains 1.24 million hectares of native forests, most of which are owned by the government and managed by the Forest Department. Forests are used for timber and other products, but are also vitally important for the preservation of biodiversity and water resources. Conversion to farmland, urban development and tourism infrastructure have resulted in the loss of 5,000 hectares of forests per year. Though commercial logging is banned, illegal harvesting of tropical hardwoods continues. Dry woodlands in arid portions of the country is also used for fuelwood, charcoal production, and conversion to grazing lands. Deforestation in Kenya has been driven largely by poor governance. Forest policy remained essentially unchanged from 1957 into the 1990s, and was characterized by corruption, a lack of transparency and accountability, inadequate financing for law enforcement, and community disempowerment. The Kenya Forestry Master Plan (KFMP), released in 1994, is an attempt to change the situation. It created the Kenya Forest Service as a new semiautonomous agency to replace the colonial-era Forest Department and emphasizes sustainability, imposing stiff penalties for illegal activities. The KFMP also recognizes local communities and the private sector as major stakeholders in forest management, empowering those who rely on forest resources to have input into decisions guiding forest policy implementation. The Forests Act of 2005 enacted into law many provisions of the KFMP. The new Kenya Forest Service has the opportunity to make forest policy more equitable and environmentally sustainable, but challenges await. For instance, indigenous settlements are no longer legally permitted in national forests, and so the Forest Service will need to address poverty and equity in developing a plan for the Kenyans who currently live within these forests. S. Geller, R. McConnell and J. Wanyiri, Linking National Forest Programmes and Poverty Reduction Strategies, Kenya, UN Food and Agriculture Organization, Forestry Department, Forestry Policy and Institutions Service, Rome, 2007; O. Luukkanen, O, Kenya Forestry Master Plan, pp. 359–70 in M. Palo and G. Mery (eds. ), Sustainable Forestry Challenges for Developing Countries, Kluwer Academic Publishers, Dordrecht, Netherlands, 1996; and World Bank Agriculture and Rural Development Department, Strategic Environmental Assessment of the Kenya Forests Act 2005, The World Bank, Washington, DC, 2007. Cohorts of Maasai youths between the ages of 14 and 24 are initiated into the Morani, or warrior class with a circumcision ceremony and a two-month sojourn in the wilderness finding their own food and water. The duties of a Morani include defending their clans and livestock against thieves and predators. According to traditional beliefs, lion hunting (Ala-mayo) demonstrates courage and strength in Moranis, and this ritual practice is still widespread even though it was legally banned in the 1970s. The motivations of cultural tradition and retaliation for livestock depredation intertwine with respect to Morani lion hunting. Studies in Kenyan and Tanzanian pastoralist settlements have found that the number of lions killed corresponds directly to the number of livestock preyed upon by lions. However, reports from organized Maasai lion hunts indicate that cultural beliefs are the root motive for lion hunting; livestock depredation may provide more of a legitimization of the hunt than a real cause. The ritual practice of lion hunting does not appear to exert significant pressure on lion populations in areas of East Africa where lions and Maasai coexist. A study in Tanzania’s Ngorongoro Conservation Area from 1985-2005 found that Moranis killed between 1 and 6 lions annually during active hunting years. This is much lower than safari hunting trophy quotas in neighboring concession areas. Additionally, Maasai custom forbids the slaughter of female lions, and so most lions hunted in Maasai territory are nomadic subadults or aging males. Since these individuals do not have any pride associations, they experience a high natural mortality rate. Ritual lion hunting remains an important rite of passage for Moranis seeking to gain respect and admiration within their clan. D. Ikanda and C. Packer (2008) Ritual vs. Retaliatory Killing of African Lions in the Ngorongoro Conservation Area, Tanzania, Endangered Species Research 6: 67–74. A reduction in Kenya’s rural electrification rate, from 16.1 percent in 1993 to 7.7 percent in 2001, is attributed to new rules promoting the privatization of the national power sector. Reform began in the 1980s with the reorganization of government-owned power companies with the goal of improving efficiency. Power sector reform accelerated in 1996 with the privatization of the industry. Privatization attempts to transform the perception of electricity from that of a public service to an economic commodity. Proponents argue that an electricity industry guided by free-market principles will be more efficient than an industry focused on sociopolitical considerations. However, case studies in Africa have shown that power sector reform causes the rate of rural electrification to decline. Rural consumers have a higher probability of defaulting on electricity bills than do urban residents, due to the higher rate of poverty in the countryside. Whereas a government-run utility may promote rural electrification schemes for social equity reasons, it is often economically unsustainable for a private company to do so. Other barriers to rural electrification in Kenya include limited financing for power companies, the high cost of developing rural transmission lines, and low electricity demand based on traditional lifestyles. As a result of power companies’ disincentive to provide electricity to rural areas, only 2 percent of rural households in Kenya are electrified, and energy needs are predominately met with raw biofuels like firewood and charcoal. Given that 76 percent of Kenya’s population lives in rural areas, this reduction means that well over half all people in Kenya live in rural dwellings without electricity. Human-wildlife conflict is inevitable in a country where agriculturalists and pastoralists must compete for land and resources with elephants, rhinos, and a range of other protected species. The government first articulated a strategy to address human-wildlife conflict in the Wildlife Conservation and Management Act of 1977. Conflict mitigation strategies included providing direct payments to rural landowners who allowed wildlife on their land, as well as the use of fences and other wildlife deterrents. But bans on hunting and wildlife produce removed economic incentives for rural communities to allow wildlife on their land. Tourism, the only remaining legal utilization of wildlife, was confined to national parks, and so did nothing to alleviate conflict on private lands. The reforms that began in 1989 under the new Kenya Wildlife Service focused on streamlining services, reducing corruption, and minimizing costs. Compensation for wildlife-induced crop and livestock damage was terminated and conflict mitigation programs were cut back. As a result, the incidence of conflict soared in the early 1990s. In 1994, President Daniel arap Moi directed the agency to confront the problem, and the Wildlife Service established a Problem Animal Control Unit as well as a Human-Wildlife Conflict Committee. Their programs benefited both communities and elephants, and the late 1990s saw decreases in elephant-induced human mortality and elephant poaching. When a new director took over the agency in 1998, however, the policy was withdrawn and the focus returned to protecting parks rather than communities. With frequent subsequent changes in management, the current state of human-wildlife conflict mitigation in Kenya is uncertain. As the elephant population expands under protection from the 1989 ivory ban, it can be assumed that the need to address conflict between elephants and rural landowners will grow. D. Western and J. Waithaka, Human-wildlife Conflict: A Kenya Case Study, pp. 357–72 in R. Woodroffe, S. Thirgood and A. Rabinowitz (eds. ), People and Wildlife: Conflict or Coexistence?, Cambridge University Press, 2005. The Kenyan Water Act of 2000 established the Water Services Regulatory Board and officially authorized service delivery by private water companies. It did not change the ownership of the resource, but permitted the commercial retailing of groundwater. The underground aquifer that absorbs rain falling on this land is a public asset but may be tapped and resold by private enterprises. Privatization only affects certain segments of the industry. Capital investment, utility management, and operation and maintenance are overseen or conducted by the government. Given that four-fifths of the country is arid or semi-arid and drought prone, Kenya has had to pursue sustainable management strategies for its water. Corruption within the public sector, however, has led to ineffective management and insufficient supply. Privatization is designed to overcome some of the shortcomings of government management, but can adversely affect low-income citizens who are most vulnerable to the impact of higher water prices. Nyeri Water and Sewage Company and other successful operations have attempted to address these concerns by charging a lower rate in poor neighborhoods. The preliminary evidence suggests that the model has potential to be extended across the country. K. O. Nyangena (2008) Privatization of Water and Sanitation Services in Kenya: Challenges and Prospects, Africa Development 33(4): 117–31; A. Ngigi and D. Macharia, Kenya Water Sector Policy Overview Paper, Enable: Energy for Water, Health, Education, The European Commission, Brussels, 2006; and W. Sammy, Water Privatization in Kenya, Global Issue Papers, Heinrich Böll Foundation, Berlin, 2004. The 1945 National Parks Ordinance under the British Colonial Government set aside reserves for wildlife such as the Maasai Mara National Reserve, which was created within an existing Maasai tribal reserve. After independence, Maasai Mara did not become a national park because the new Kenyan government recognized that traditional pastoralists inhabiting the area would need to benefit as well for the arrangement to succeed in the long term. While these national reserve arrangements have had a great deal of success and have bolstered tourism, the development and management of the reserves still requires much improvement. Under an agreement reached in 1961 with the Kenyan government, management of Amboseli, Masai Mara, and a few other reserves was shifted to local Maasai councils. However, these councils have not always represented the interests of those most impacted by the park. A central portion of the Maasai Mara is dedicated exclusively to wildlife, but tourism occurs beyond the borders of the reserve as well, in the group ranches of the Maasai. Only about 20 percent of the $3.5 million received by the park in 2002 was redistributed to bordering communities. Overdevelopment of the reserves has had detrimental effects on the Maasai and on wildlife. The Narok County Council has granted concessions for hotels and farming to non-Maasai around the park, and facilities within the park are overcrowded and poorly maintained. In 2006 the Kenyan journalist Storm Stanley wrote: “too many vehicles are harassing the wildlife… too many trails are being blazed off-road, and the Reserve’s natural resources – with 40 permanent lodges, as well as many mobile camps – are under strain as never before.” The wildebeest population has declined 80 percent, and overall wildlife populations declined almost 60 percent from 1977 to 1997. M. Honey, Community Conservation and Early Ecotourism: Experiments in Kenya, Environment Magazine, January 2009; R. H. Lamprey and R. S. Reid (2004) Expansion of Human Settlement in Kenya’s Maasai Mara: What Future for Pastoralism and Wildlife?, Journal of Biogeography 31:997-1032; and Nancy Lee Peluso (1993) Coercing Conservation? The Politics of State Resource Control, Global Environmental Change 3(2): 199–217. Soon after the Kenyan government declared HIV/AIDS to be a national disaster in 1999, the federal government established the National AIDS Control Council. This organization formulated a comprehensive national strategy that contributed to a decline in the infection rate from 10 percent in the 1990s to 7 percent in 2003 – only the second documented sustained decline in Sub-Saharan Africa. The Council has promoted condom use and voluntary counseling, and the latter was used by 200,000 people in 2003. Services to prevent transmission from mother to child have been used by 120,000 pregnant women, and antiviral therapy has been offered to 20,000 people. In conjunction with these efforts, the Ministry of Education has formed Primary School Action for Better Health, a program reaching 5,000 elementary schools. New knowledge and perceptions have changed high risk behavior, particularly with regard to condom use and the number of sexual partners. J. K. Ndambuki et al., An Analysis of HIV/AIDS Policy Formulation and Implementation Structures, Mechanisms, and Processes in the Education Sector in Kenya, Overseas Development Institute, London; and B. Cheluget et al. (2006) Evidence for Population Level Declines in Adult HIV Prevalence in Kenya, Sexually Transmitted Infections 82(1):21–26. Traditional rules and norms in Kenyan and Maasai society have limited women’s economic opportunities. Until quite recently, land ownership has been restricted to men; indeed, the Kenyan government distributed land rights to male heads of family when Maasai communal lands were partitioned in the late 1990s. Land use access has also been gendered with regards to the use of resources such as trees, shrubs, and crops. The 2010 Kenyan Constitutional Referendum, passed by a vote of the Kenyan people, grants equal matrimonial and property rights to every person. All marriages must be registered, guaranteeing that women can contest claims with in-laws if their husbands die. It is unclear how the new constitution will affect property ownership for the Maasai and other ethnic groups in which women are only viewed as caretakers of property. The constitution explicitly states that no traditional rules are allowed to override the new Bill of Rights, which includes the provision that “Women and men have the right to equal treatment, including the right to equal opportunities in political, economic, cultural and social spheres.” Because the change is so recent, there is scant research evaluating how the new constitutional rules are changing Kenyan gender relations. M. Ndulo (2011) African Customary Law, Customs, and Women’s Rights, Indiana Journal of Global Legal Studies 18(1):87–120; D. Rocheleau and D. Edmunds (1997) Women, Men, and Trees: Gender, Power, and Poverty in Forest and Agrarian Landscapes, World Development 25(8): 1351-71; and S. Mbatiah, A Brand New Constitution, but Can Women Enjoy Land Rights?, Inter Press Service, Nov. 23, 2010.